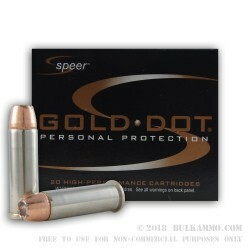 The 38 Special dominated the American Police Force as the weapon/caliber of choice for nearly 70 years. With that kind of track record, it should come as no surprise that private citizens still rely on the .38 Special for their self-protection needs. 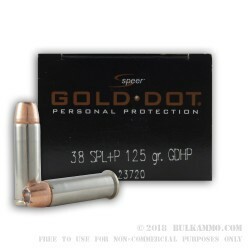 Speer tops their nickel-plated brass casings with 125 grain jacketed hollow points (JHP) known and loved for their bonded cores and ability to expand rapidly and reliably in the toughest situations. Speer forms their JHP bullets by taking a soft lead core and bonding it to its copper jacket using their Uni-Cor electrochemical bonding technique. This process helps Speer reduce jacket variances and blemishes that can impact expansion and accuracy. 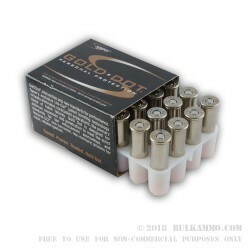 In addition to being extremely high-functioning in the chamber, the nickel-plated brass casings used for this .38 Special ammo are Boxer-primed, non-corrosive, and reloadable.